Another great Glastonbury download, here's Bon Iver's set. The full show zipped and up on Megaupload. Not sure what the "+"s are for, because I found this on some French blog, but here's the reported tracklist. I'm really liking the idea of the Exogenesis Symphony, although it could well be some overindulgent nonsense. Hopefully not. Today marks the Irish release date of the Duckworth Lewis Method's debut album. This is an album I've been really excited about, and I am delighted that this day has finally come. It's available in all the usual record shops, Road Records, Tower Records, HMV, all of them really. Speaking of Tower Records, the band performed a nice intimate gig to promote the album yesterday (Peter from 2uibestow was in attendance, lucky bugger) and went down a storm. The new album is also being very well received. Today's Times and Guardian in the UK have given it glowing reviews. I highly recommend you buy it. It's the album of the summer. Ashes or no ashes. Have I told you how excellent Night Horses is? I have, haven't I? I may even have harped on about it. 2009 is a great year all-round for Irish albums. Holy Roman Army, ASIWYFA, 202s have all released brilliant albums. And SEBP's new one is one of the best this year. They'll be playing a headline show at Dublin's Academy on November 13th. Tickets are priced €17.50, and are on sale now. It didn't take long at all, but the Pixies' triumphant return to Dublin as sold out. In two minutes. All the tickets were gone by 9:02 this morning, much to the dismay of many people at home trying to purchase tickets on their computers. They'll be playing the Olympia Theatre on October 1st and 2nd, but you'll have to check toutless.com or look for returns to have any chance of seeing them now. They have no gig lined-up for the 3rd of October, so maybe they'll add another date before heading off to Scotland the following day. Two members of the Oxegen forums have made some printer-friendly Excel spreadsheets of the stage times that you can download and print for this year's festival. They're really handy as you can print a few copies out and have them in your pocket on the day. You can also plan in advance who you're going to see and when. They're rapidshare files, but are quite small, so shouldn't upset your bandwidth! Short video from CNN of Michael Jackson's rehearsal for the upcoming O2 concerts. 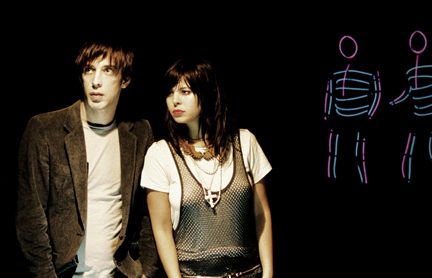 Even more acts added to Electric Picnic 2009. And some damn good ones too! Dinosaur Jr, Neko Case, Major Lazer are the pick of the bunch, with some homegrown heroes such as Julie Feeney added into the mix. Full timetable of the lineup for Oxegen 2009 released today. Blitzen Trapper have a lot of Irish dates in their schedule as part of their upcoming European Tour. They play Electric Picnic, support Wilco, and even visit cities outside Dublin doing their own headline shows. There's a great reason to go to the shows (apart from catching them live, of course), they sell a six song EP only at their live shows. U2 opened their newest tour, in 360 degrees last night at the Nou Camp in Barcelona. They paid tribute to the late Michael Jackson by playing short teases of 'Man in the Mirror' and 'Don't Stop 'Til You Get Enough'. Dan Boekner from Wolf Parade brings his other incarnation, Handsome Furs, to the Academy in Dublin on Tuesday 27th of October. They've just released the excellent Face Control, which is an album I highly recommend. Tickets for the Academy show are €16.50 and are on sale this Friday, the 3rd. Jamie T is set to release his latest release the Sticks and Stones EP, his follow-up to the powerful Panic Prevention. To promote it, he'll be visiting our shores to play Whelan's on Saturday October 24th. Tickets go on sale this Friday at a price of €18.95. 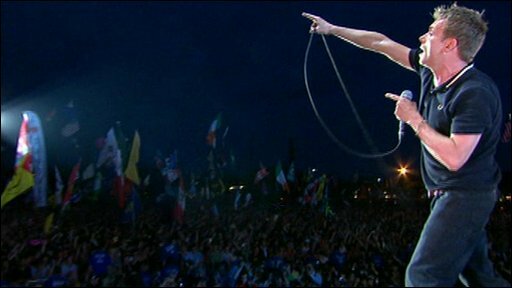 Thanks to Rubi at the Blur Forum for uploading and posting the full recording of Blur's reunion at Glastonbury 2009. BBC has removed a lot of videos from youtube of the gig which is a bit disappointing. Guess they want you to use iPlayer to watch. But what about us in Ireland? The reunited Pixies will play 'Debaser' and some other classics when they come to Dublin for two dates as part of their European Tour. They will play the Olympia Theatre on October 1st and 2nd. Tickets for each night cost €44.20 and €54.80 and go on sale this Friday at 9. The Black Ice train stopped off in Ireland for a legendary performance from AC/DC.